One specialty that we at Positronic Design, The SEO Company, have tried to focus on is Personal Injury Lawyer organic search engine optimization. To enhance our reach and reputation in this field, we have developed a national directory of Personal Injury Lawyers with listings in all 50 states. 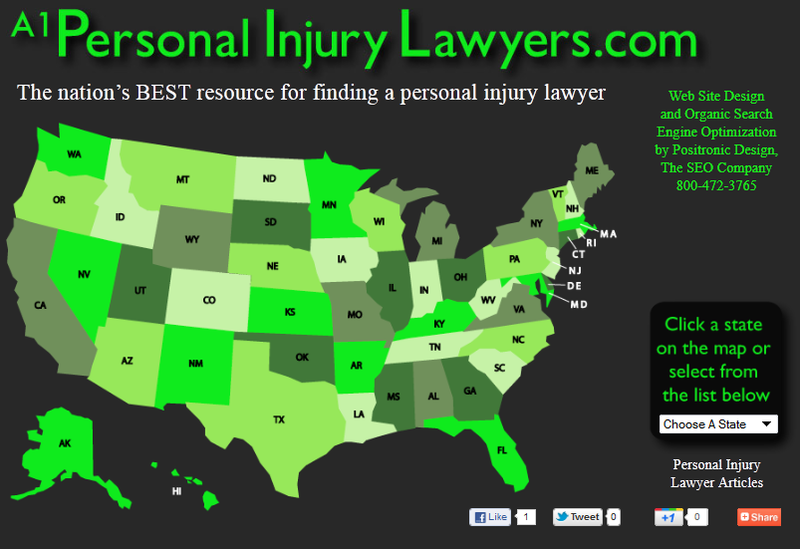 This is called A1 Personal Injury Lawyer Directory and is found online at A1PersonalInjuryLawyers.com. We built this personal injury lawyer directory to help our attorney clients get higher search rankings and more exposure, and also to provide a resource for people who are looking for a car accident lawyer or medical malpractice attorney or any other type of P.I. lawyers that’s available. Personal Injury Attorneys or Firms that are interested in getting an SEO-friendly directory listing from a highly relevant web site may become premium sponsors for only $195 per year. Only 5 premium listings per state will be made available. Premium Listings are also made larger and positioned on the top of the page, above all the other listings. Only Premium Listings contain embedded web site links. Attorneys who retain Positronic Design, The SEO Company, for ongoing off-page-factors search engine optimization services are given a premium sponsorship as an included part of their overall package for no extra charge. If you’re a personal injury lawyer who’s interested in a Premium Listing and/or looking for organic search engine optimization services from an experienced SEO agency with years of relevant experience, give us a call today at 800-472-3765 or fill out our convenient Get SEO Analysis form above. References are available on our SEO Company Testimonials page and upon request.